HomeBloggingTired minds don’t plan well. 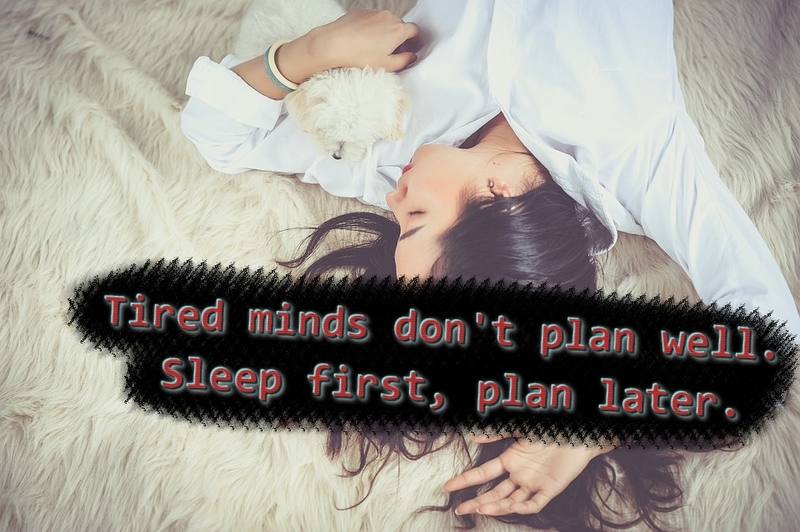 Sleep first, plan later. Today I am feeling tired, simply because I got to bed quite late, had to wake up a couple of times in the middle of the night, and had to wake up early in the morning. I am not suffering because of it, but I do feel like my head is a bit drained of creativity and incapable of doing great work! Now, tiredness is often a temporary thing for me. I might only sleep 4-5-6 hours a night, but still, I will be able to perform well on the next days. But, during these days there will always be a “down” period in which I want to go to bed, sleep, eat and drink unhealthy stuff… something just to gain new strength and to relax for some moments. I believe that it is okay to be tired now and then, but it is not good to walk around constantly tired. It will drain your power, it will steal your creativity, and it will not have a good impact on your health! I like to stay up in the evening to get work done. But, this will often result in less sleep, as I still have to get up early in the morning, and occasionally be up with the kids in the middle of the night. But, is it worth it? I can get stressed if I do not get the work done, but maybe the total quality and quantity of my work will get better if I sleep enough, compared to staying awake for some more hours, but the consequence is that I am much more tired throughout the entire day and not at all as effective and creative during my actual work time. To be honest, I do not have an answer always, but I know it is important with enough sleep! What about you? Are you sleeping enough? How does it impact you if you do not sleep enough? Does SteemPress confuse Google? SteemPress and SEO!